Hello my stamping friend! I hope you’re having a great week, and are ready for another fun challenge with the Paper Craft Crew! This week it’s a fun Sketch; just follow the sketch outline (feel free to change the focal shape, or turn it on its side), and create away! Yes, I stayed with a holiday theme! Although, this little mouse could be singing ‘Happy Birthday’, if you changed up the wreath embellishment! 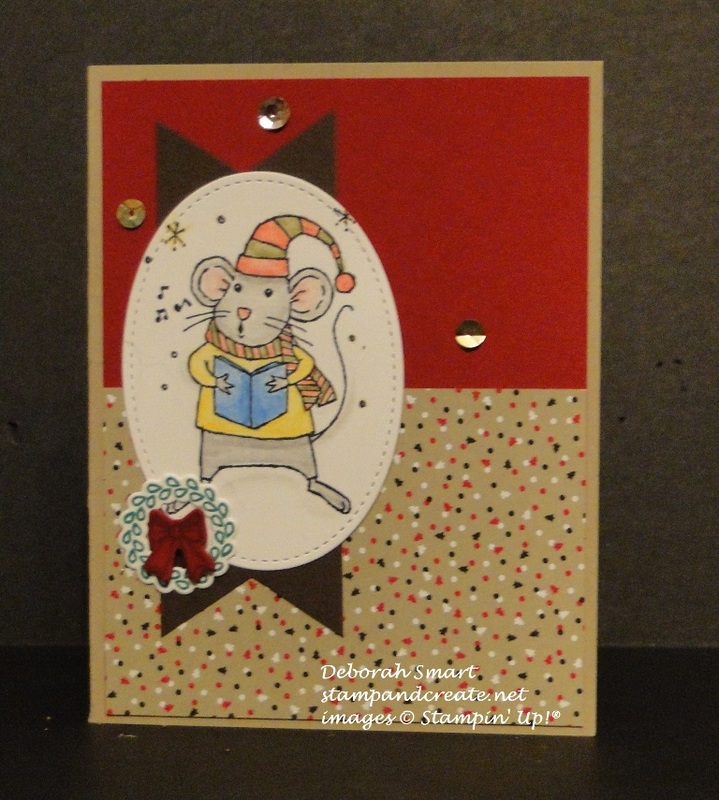 I stamped the mouse onto Whisper White cardstock, and used a new product that I know you’re going to LOVE from the upcoming Occasions Catalogue – Watercolour Pencils!! You’re going to love how easy these are to colour with; you can use them as a regular pencil crayon; or blend them with Blender Pens or Aqua Painters. The colour blends so smoothly, you’ll wonder when you graduated from art class! I coloured the mouse with the Real Red, Daffodil Delight, Old Olive, Pacific Point and Smoky Slate pencils, and used a Blender Pen to blend and shade each colour as I went along. I then used the Big Shot and the Stitched Shapes Framelits Oval shapes to die cut. I used Crumb Cake cardstock for my card base, and layered Cherry Cobbler cardstock, then a pattern from the Candy Cane Lane Designer Series Paper on the bottom half. I cut a banner shape from a piece of Early Espresso cardstock, and layered that behind my mouse oval. After layering the pieces, I stamped the wreath and bow from the Santa’s Sleigh stamp set, then used the coordinating Santa’s Sleigh Thinlits Dies to die cut them. You can still order these as a Bundle at 10% OFF, until the end of the month – but hurry!! I attached them to the card front, then added a few gold sequins from the Gold Sequin Trim. I decided to let me mouse keep centre stage, and not add a sentiment to the front. I hope you enjoyed seeing my card; please head over to the Paper Craft Crew blog page to see the cards created by the rest of our amazing Design Team! Then I hope you’ll feel inspired to create your own card, and link it up for the challenge. Thanks for spending some time with me today! I appreciate it. If you’d like to order any of the supplies I used to make this card (or anything else you may need), just click on the images below, and you’ll be taken directly to my online store.